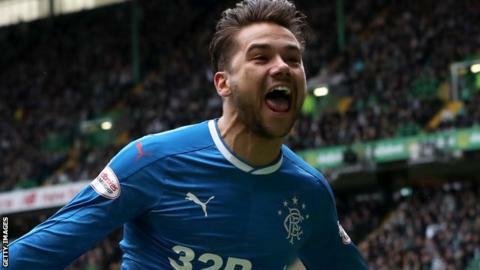 AFC Wimbledon have signed Rangers midfielder Harry Forrester on a season-long loan deal. The 26-year-old joined Rangers in January 2016 from Doncaster and went on to make 44 appearances, half of which came in the Scottish Premiership. "Harry brings a quality going forward that we need a little bit more of," said assistant manager Neil Cox. "His goalscoring record is good, he's played at a higher level and he just wants to get started." Forrester was on the books of Northampton, Watford and Aston Villa as a junior but made his breakthrough in senior football during a loan spell at Kilmarnock. He joined Brentford in 2011, playing 69 times, and then had a two-and-a-half-year spell at Doncaster.